The fair also unveiled its new poster for this year’s event featuring the artwork of Jo Mora (1876-1947), the celebrated Carmel artist, sculptor, author and muralist. The colorful poster features a fairy princess carrying a shining star wand, sitting in a flower-bedecked coach with lightning bugs providing light and beetles resting from pulling the coach. The poster exhibits some of Mora’s trademark touches, including whimsy, great detail and precise coloring. The image is an illustration from Mora’s children’s book “Budgee Budgee Cottontail.” Mora wrote the story and did the illustrations in 1936 while he was traveling around the world on a freighter with his family. But it was not published until 1995, based on a promise Mora’s son, Joey, made to his father to see that it find the light of day. 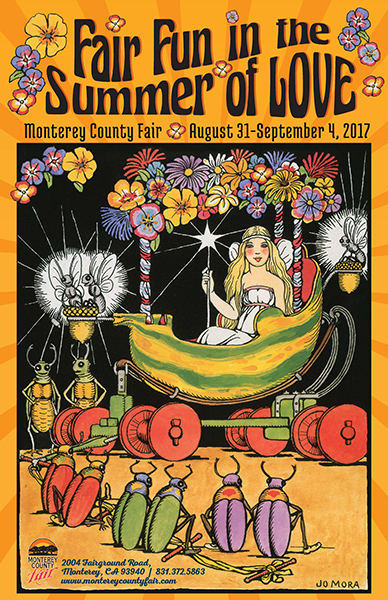 The image comes from the Jo Mora Trust and is the fourth time that one of Mora’s illustrations has been used by the Monterey County Fair for its poster.